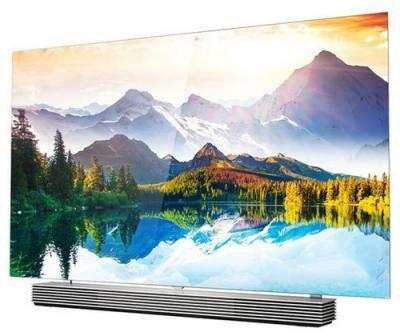 As we reported last week, LG's flat 4K OLED TVs are launching soon. LG Electronics announced the pricing and availability of the new family of flat UHD (4K) OLED TVs, the EF9500. The TVs will start shipping next month (September 2015), with the same price as the curved EG9600 TVs. LG's official prices (in the US) for their 4K OLEDs are still $6,999 for the 65" models and $5,499 for the 55" models - even though you buy the 65" curved OLEDs for $5,999 and the 55" ones for $3,999. So it's highly likely the flat models will retail for the same prices. The flat EF9500 is also LG's first HDR-capable OLED TV. LG's curved EG9600 OLEDs will soon receive a firmware HDR update. Other features of these OLED TVs include a quad-core CPU, an anti-glare filter and WebOS 2. What makes this HDR? I get the black levels, but what's the max brightness? 800 nits? 1000 nits? Assuming that these new "HDR" OLEDS achieve the necessary brightness, what effect will that have on their lifespan, or their vulnerability regarding burn in? Lastly, what dynamic range can these displays represent assuming the proper content? Bout time they got some flat sets out there instead of that curved rubbish. Now.. if only they can get 'em below $2000 for a 65" version so I can plug one into my living room.